Let’s have cash infusions in return for warrants. When the speculative fever finally broke in America’s housing industry and house prices began falling in search of equilibrium levels, banks everywhere suffered defaults and subsequent losses on a range of assets. In short order, the housing contraction morphed into a banking crisis. Among most economists, it came as a surprise that the banking industry and, indeed, most of the financial sector, was so devoted to houses. We had not realized that the investment and innovation in the country’s business sector was largely getting by on rich uncles, a tiny cottage industry of venture capitalists out West, and a few private-equity funds doing alternative energy. And we didn’t foresee that a trillion or two of losses in an economy with $40 trillion of financial wealth could bring high anxiety and, two weeks ago, near panic. The banks’ losses might seem poetic justice after their abominable performance. But costly feedback effects on the rest of us are in prospect. Uncertainty over the quantity and valuation of banks’ “toxic assets” has meant that many cannot count on loans from each other to meet daily needs, and this illiquidity in the markets has impaired their ability to lend. Among banks that had excessively leveraged their capital through borrowing and other devices, the losses wiped out much or all of their capital, and this near-insolvency has dampened their willingness to lend. The resulting credit contraction is starting to crimp working capital and investment outlay at small businesses and is having wider effects on business activity through its impact on interest rates, exchange rates and consumer loans. This feedback is causing a fall of employment on top of the direct effect of the housing contraction on employment in construction and finance. The added fall in jobs will in turn add to mortgage defaults. Will this chain reaction produce a deep slump, like Japan’s in the 1990s or, worse, America’s in the 1930s? In my view, the claim by Keynesians that the economy can be stabilized around a satisfactory employment level, thanks to economic science, is false. So is the claim by latter-day neoclassicals that such stability is automatic, thanks to the market. Both dogmas fatally miss the point that the normal activity level is driven by structural shifts, which monetary policy and price-level changes usefully accommodate but cannot reverse. The end of the speculative fever and the credit crunch each have structural effects on the real prices of business assets, real wages, employment and unemployment. As I see it, the former has pushed up the normal, or “natural,” volume of structural unemployment. The latter (and the excess houses) is pushing the economy into a temporary slump. It will last as long as required for the banks’ self-healing and government therapy to pull us out of it and into the neighborhood of our new, postboom normalcy. I believe that leaving the process of recovery entirely to the healing powers of the banking industry, as libertarians suggest, would be imprudent, even if the banks could manage it. Lacking much government intervention, Japan’s recovery took a decade. Sweden’s recovery, with state intervention, took hardly any time at all. Right now our banking industry is barely operational. Whatever the corrective surgery indicated, the priority is to get the system operating again. Delay would be costly and risky. The most discussed of the proposed programs would address banks’ toxic assets by authorizing the Treasury to buy them, issuing debt to finance the purchase. Proponents of this program add that the government’s eventual sale of the assets purchased might repay the investment with a profit — grossing, say, an 8% rate of return while paying 4% interest. House Republicans and some economists object, saying that the government could attain its goal with a bigger or surer profit by selling the banks “default insurance” on their distressed assets: the premiums paid are hoped to far exceed the default costs. To me, government entry into the default insurance business is little different from government purchasing the assets. It is not clear to me that selling default insurance would be more profitable. House Democrats want a parallel program that would help defaulting mortgage borrowers to avoid foreclosure — to help them “stay in their homes.” Such a step might set an undesirable precedent in economic policy. If, after investing in my vocational training, I cannot make it in the line of work I chose — not at the real wage that the market has since established, at any rate — will I be entitled to help from the government to “stay in my work”? Furthermore, many defaulters are housing speculators not families caught up in an adjustable rate mortgage they did not understand. Finally, the overinvestment in houses does not present the systemic risk of economic breakdown that the overextension of credit does. However, the program to revive the operation of the banks through purchase of the toxic assets faces a sticky wicket. If the government sets the prices too low, the banks will supply little of their assets; they will prefer to hold them to maturity in order to get the price appreciation for themselves. The Treasury will then need to raise the terms. But that may cause the banks to hold off longer, speculating on still better terms ahead. If, instead, the Treasury sets its prices too high, its funds will go far enough to buy only a portion of the toxic assets offered in response. Thus, it is not certain that such a program would work to clean out the toxic assets at all quickly. Subnormal operation of the banking industry might drag on for a few years. A program of asset purchases, however needed, is limited in scope. It cannot be counted on to increase the equity capital of the banks — to shore up their solvency. 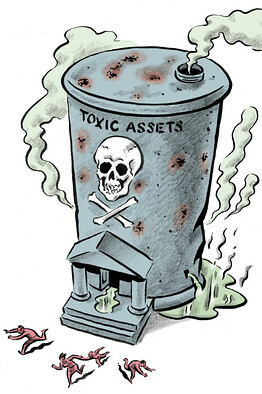 Underpaying for the toxic assets would actually inflict a further loss of capital. Overpaying the banks for their toxic assets could contribute capital, but that may not be politically feasible or attractive. So it is clear that the main prong of any “rescue” plan must serve to advance the recapitalization of the banks. Cash transfusions in return for warrants are a good way to do it, as it lets taxpayers share in the upside. The rescue of Chrysler used warrants. This past Monday the FDIC got $12 billion in preferred stock and warrants in the deal that saw Citigroup buy Wachovia. The question is which banks are to be thrown a lifeline, which will have to sink or swim. This one-time dose of corporatism is unpleasant, though the banking industry is to blame for its necessity. But these steps toward making the system operational again will leave it dysfunctional. We don’t want to restore the system as it was. And the risk that the industry would cause another round of wreckage is not the only reason. What has occurred is not just an old-fashioned banking crisis but also a banking scandal. Most of the big banks were shot through with short-termism, deceptive practices and self-dealing. We must institute basic changes in corporate governance and in management practice to restore responsibility and honesty for the sake of the economy and for the self-respect of the country. Mr. Phelps, the winner of the 2006 Nobel Prize in economics, directs the Center on Capitalism and Society at Columbia University.